Los Angeles could produce the nation's largest "virtual power plant" by linking homes equipped with solar panels and batteries, solar industry says. The concept of a "virtual power plant" that could replace one of three natural gas plants being phased out by the city has already been deployed successfully in Orange County and Waltham, Vermont. But Los Angeles, where officials want to rely entirely on renewable energy by 2050, would be the largest U.S. city to go virtual. "What we can do is if we can put a battery with each one of those solar systems, we can link them with software and when the utility needs that power, it can be dispatched from 75,000 homes," said Sunrun CEO Lynn Jurich. "They can replace the energy of one of those gas-power plants and be more cost effective." Los Angeles Mayor Eric Garcetti announced in February that three of the city's gas-powered generating stations would be phased out by 2029. "This is the beginning of the end of natural gas in Los Angeles," he said at the time. Asked if the city was open to the kind of virtual power proposed in Sunrun's report, Garcetti said in a statement, "We have an obligation to end dependence on fossil fuels, embrace the technologies of tomorrow, and prioritize renewable energy." As utilities like San Diego Gas & Electric employ "time of use" rates that charge more for prime-time juice, solar panels paired with battery storage could be more attractive for ratepayers, said solar expert Bill Powers of Powers Engineering in San Diego. "Utilities have shifted to that peak, high-dollar window, from 4 p.m. to 9 p.m., which is being done to make solar less economically attractive to people," he said. "Solar is not putting out a lot of power at that time." "But they did that as batteries were becoming cost effective," Powers said. "What they did to stymie solar became a driver for people to get batteries." Beth Ferguson, director of Sol Design Lab at the University of California, Davis, and adviser to a startup that plans to use recycled vehicle batteries in homes, says the increasing accessibility of battery storage means "you can reap the benefits from solar at night." Investor-owned SDG&E, which serves California's second-largest city and has 1.25 million residential customers compared to L.A.'s 1.34 million, said that renewable energy is "intermittent" because of weather conditions. Yet nearly 45 percent of SDG&E's energy comes from renewable sources, said spokeswoman Helen Gao in an email. 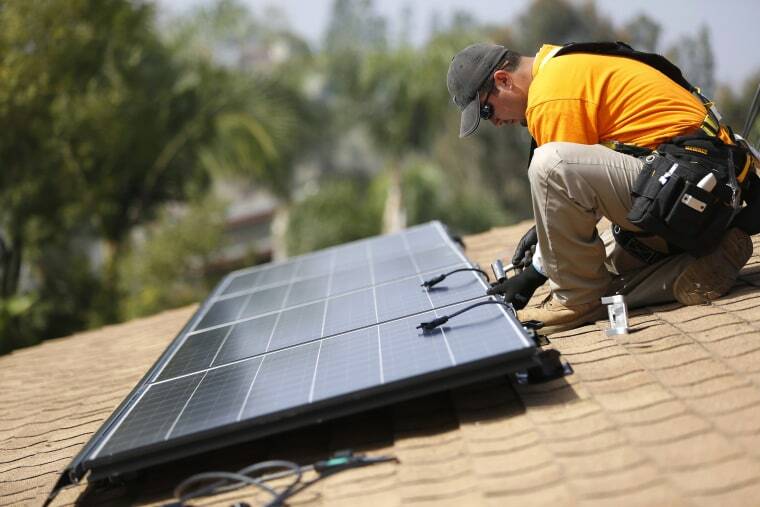 The Sunrun report credited San Diego with beating Los Angeles when it comes to residential solar, with more than 1 in 10 homes equipped to tap the sun compared to less than 3 in 100. To create one virtual power plant in Los Angeles would be to "reach the same level of solar penetration San Diego already has," said Sunrun's Jurich. Investor-owned utility Southern California Edison claims to have launched the first such system in the nation last year. In March, the virtual power plant's operator, AMS, announced it had delivered a record 2 gigawatt hours of energy. Despite that success, Powers says publicly owned utilities like L.A.'s Department of Water and Power might be more amenable to virtual power plants because there are no shareholders demanding ever-increasing profits. In Vermont, Green Mountain Power has offered Tesla's Powerwall home batteries to as many as 2,000 customers for $15 a month. It allows them to store solar power or sell it back to the shareholder-owned utility to create a virtual power plant. In December, the utility announced that 90 percent of its energy supply is now "carbon free." "This opportunity in L.A. would be the biggest virtual power plant that we know of," Jurich said.